This turntable is totally adjustable. Using a simple sliding hinge, the angle which is just right for you can be locked in. A non-slip surface insures that your piece will stay put as you rotate it without the use of clamps. Compact in size this turntable will fold flat for easy storage and transport. Also provides a flat surface for painting vases, pitchers, urns, etc. Encourages the use of good posture as you paint and relieves pressure in shoulders, neck and wrists. 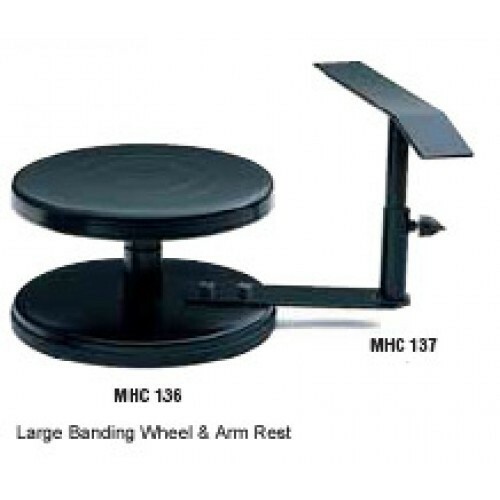 Plates up to 14″ can be painted using the Tilt-A-Wheel. Topper insert extends the painting surface for larger pieces.